Ronnie’s â€œartistic awakeningâ€ was brought about from an early age, kick started when his childhood artistic creations were featured on the BBC television programme Sketch Club. Since then, he has continued to put pencil to paper; ultimately leading to his fantastic debut collection for Washington Green. 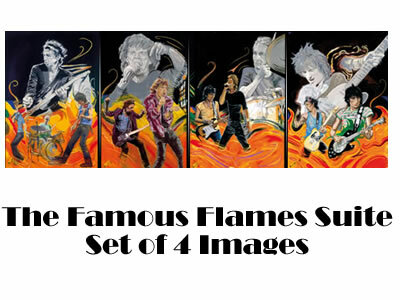 This collection particularly conveys the intertwining of Ronnie’s two great passions, music and art; as his series of four pieces titled â€˜The Famous Flames Suiteâ€™, and the fifth and final piece â€˜Stones On Stage â€“ Got Me Rockinâ€™ all recreate the energy and raw atmosphere exuded by the Rolling Stones during a live performance. 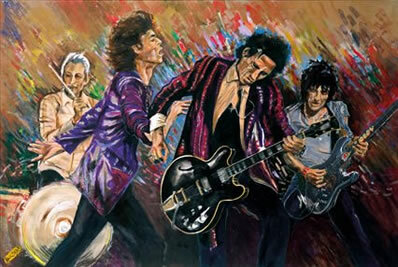 Through his artistic interpretation, Ronnie offers us a front row view of the Stones in action. 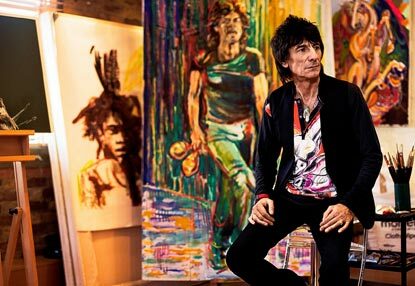 Wood references photos of the Stones taken during performances to recreate the accurate facial expressions of his band mates, bringing an element of realism to his figurative works. Yet alongside this realism, an aspect of fantasy is brought to the table through his use of vivid colours created by applying acrylics, then oils, and finally embellishing the canvas with oil pastels. For instance, in â€˜The Famous Flames Suiteâ€™, the Stones are performing amidst waves of dramatic orange flames that theatrically echo the vibrancy, energy and rhythm of a live performance by The Rolling Stones. This collection is simply a stunning celebration of The Rolling Stones’ musical legacy that can be adored and appreciated by music and art lovers alike.